The gold rush and gold fever transformed California in two short years. And the Harlans were there at the start. 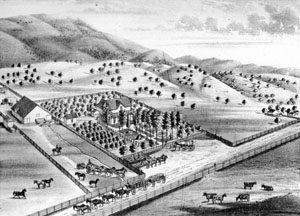 Joel Harlan, one of the San Ramon Valley’s early settlers, learned about the discovery of gold from his good friends, the Wimmers, who were in Coloma when gold was found Jan. 24, 1848. In April 1848, Joel and his cousin, Jacob Harlan, were running a livery business in San Francisco when they received a letter from their “Uncle Peter” Wimmer. He told them about the placer gold discovery and urged them to come to Coloma to mine immediately. The Harlans were among the first to hear directly of the discovery, because Sutter was trying to keep it quiet. The news was printed first in The Californian on March 15, 1848. The Californian article read “Gold Mine Found. In the newly made raceway of the Saw Mill recently erected by Captain Sutter, on the American Fork, gold has been found in considerable quantities.” This announcement did not elicit much attention at the time. In May, however, a dramatic action by young Mormon Sam Brannan really set off the gold rush frenzy. He was an energetic entrepreneur with a store in New Helvetia (Sacramento). After being paid in gold by talkative local miners, he became convinced that the gold discoveries were legitimate and took steps to make money from the find. He stocked his store with all the merchandise he could get, went to San Francisco on May 12, 1848, and waved a bottle of gold dust in his hand, yelling “Gold! Gold from the American River!” Many historians mark the real beginnings of the California gold rush from that day. William Leidesdorff, a prominent landowner and civic leader in San Francisco, was a friend of the Harlans and agreed to advance them the money. Jacob said, “My purchases that day amounted to $4,500, for all of which Leidesdorff made himself responsible.” Harlan bought the things miners would need: groceries, flour, beans, liquors, dry goods, shoes, tools, shovels, picks, tin pans, kettles and ammunition. Their Uncle Peter, still working on the sawmill, put them up in Coloma until they built a cabin. They found the miners would pay whatever “we demanded for our goods”: flour cost $1 a pound, coffee $1.50. Jake made money selling colorful cloth with holes cut out as sarapes to the Indians. Jake said, “They had much fine gold which they carried in vulture or goose quills.” They loved the sarapes and were not stingy. In one day, two bolts of fabric brought $1,200. Gold fever spread from California to the world as forty-niners arrived from Mexico, Europe and China.